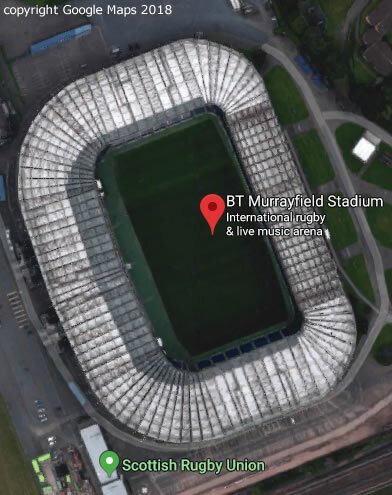 Located just 3 miles from Murrayfield Rugby Ground, the Thistle DHU B&B in Edinburgh is in the perfect location for an overnight stop, or for several nights if you are contemplating exploring Edinburgh as part of your trip to the Rugby Stadium. We are situated just 3 miles away from the rugby ground, which is conveniently accessible via the excellent local bus service, which journeys right to the city centre. We offer free private and off-road parking for your convenience, making it easy to leave your vehicle here whilst you journey onward to the rugby stadium. Our well-appointed rooms offer all the facilities you would expect from a 3-star Bed and Breakfast. We have two twin rooms available and a family room with one single and a double bed, making us the ideal base for a family, or a group of people travelling together to attend the rugby. We offer a full traditional Scottish breakfast in our light and airy breakfast room, the perfect way to start any day, and can cater for those people who have special dietary requirements, whether you are vegetarian or Coeliac – please just let us know when you make the booking and we will be happy to accommodate your specific needs. And if you want to plan your day carefully our modern and bright conservatory area is the perfect place to sit and finish your tea or coffee whilst making those all-important plans. If you have travelled up for the Rugby with family members who will not be attending the match then there is plenty to do, and all within easy reach of the B&B. Just a short 10-minute walk away from the B&B is the Gyle shopping centre which has plenty of shops, over 50 in total, and a conveniently located food court; perfect for enjoying a few hours of retail therapy. We are also just a short 4-mile bus ride away from Edinburgh city centre itself where you will find plenty of shopping opportunities as well as of course the many tourist attractions that Edinburgh has to offer. In the evening there are a wide variety of restaurants located within walking distance of the B&B, giving you the opportunity to explore the surrounding area and enjoy more than just the Rugby when you visit. Whether you’d like to know more about the B&B or wish to make a booking, we’ll be happy to help. Simply get in touch and we’ll be delighted to help you plan your visit.